look over at the young man seated in front of me. He has light, wide set eyes and a face as open and trusting as the first page of a brand new journal. An unguarded face lit now by a smile both shy and warm. “What’s your experience been like so far?” I ask him. “Beautiful,” he says, “ I love gifting people my work and having them let their heart decide how much to give.” “But what made you decide to work in this way?” I ask him. “Three eight-year-old monks stood on a cliff edge and saved my life,” responds Ankur, his voice bland and friendly, as if the occurrence he speaks of was the most natural thing in the world. Three eight-year-old monks stood on a cliff edge and saved my life. A dazzling, utterly unexpected sentence – in my mind’s eye I see the flash of deep red robes, a desolate path hugging a rocky mountainside, boyish laughter and a dizzying drop. “You are going to have to explain,” I say. Because no matter who you are you cannot possibly drop a sentence like that on a person and then expect the conversation to drift into the subject of traffic or the weather. And so I came to learn that two years ago, Ankur had traveled to Kashmir and wandered the mountainsides of Ladakh taking photographs. When a group of young monks-in-training invited him over to shoot a game of football, he readily accepted. In making his way to their playing field he found himself on a winding path high above the valley. It was then that his foot slipped, perhaps on a stray pebble and in a split second he found himself precariously balanced on a narrow ledge. One wrong move would mean a fatal plunge to the floor of the valley. But even before that thought had fully formed in his mind they were already there. Three of them. No higher than the middle of his chest, their red robes flapping in the wind, holding hands and forming a spontaneous boymonk-fence between him and the next world. Without debate or deliberation these children had put their lives on the line for him. He didn’t even know their names. As Ankur edged to the safety of higher ground, willing himself not to slip, his mind went quiet, the questions confronting it too big to be answered by reason or logic. Who were these young monks and by what power had they done what they did? His young rescuers did not seem to give their actions a second thought, they ran ahead on the path to a little waterfall and proceeded to do what all children will do when confronted with running water – they splashed and squealed and played. We close our eyes and the room slowly stills. There is a beautiful paradox in the fact that people can sit alone and yet together in this way. Going within is such a highly personal act, and yet there is something gained when people collectively practice this individual mode of being. I remember being impressed by the absolute ring of truth in his answer. I don’t know. I don’t think I’d experienced before what a powerfully sufficient answer it can be. Later that same evening Sachi slips a large envelope into my hand. “A gift from Ankur,” she says, “for you to pay-forward.” Inside were a stack of large prints of his photographs. 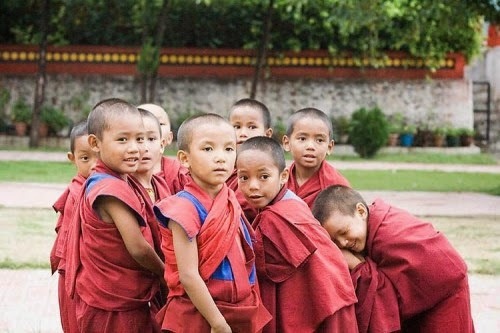 Many of them featuring little monks in red robes, their faces animated, their gestures so alive. It is clear that their photographer is blessed with an ability to see through the surface contours of the moment straight to its heart. I am properly stunned by the unconditional generosity of the gift. I smile seeing that he has framed his transformation in brief bullet points, as if it were no more extraordinary than a grocery list. 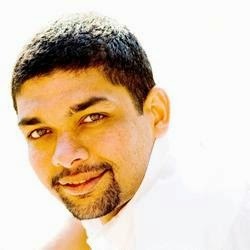 Ankur has no regrets about the unusual choices he has made. And it would seem that his journey continues to unfold in sync with a hidden master plan.